The Traverse city state hospital was built in 1881 and was the 3rd asylum constructed in the state to meet with the growing number of patients deemed mentally ill.
Perry Hannah, who was known as the founding father of Traverse city used his political influences to have the asylum built in his home town, as well as donating a substantial amount of money to make it the finest in the state. When the doors of the first building opened in 1885, which was known as building 50, the hospital was capable of treating 43 patients. Most early asylums were known to be places to avoid, with barbaric treatments and overcrowding being commonplace, but not at the Traverse city asylum. Before the introduction of drug therapy in the 1950's the asylum employed the "beauty is therapy" philosophy. Patients were treated with kindness and comfort and restraints such as the straight jacket were strictly forbidden. The asylum expanded constantly throughout its life and became the biggest employer in the city. It ended up with a number of cottages and a large farm which made the asylum self sufficient. Patients were given jobs farming crops or looking after animals as part of their treatment, and the farm even produced a world champion milk cow was grave can be seen on the grounds to this day. In modern times many of the smaller buildings were demolished during the 1990's, but a number of the other buildings have been converted into apartments or businesses. As for the main hospital building itself it was listed on the National register of historic places in 1978 and designated a Michigan State Historic Site in 1985. Is Traverse City State Hospital Haunted? 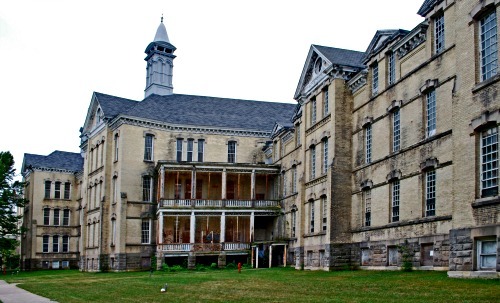 Most asylums have pretty nasty histories which are often the foundations of their hauntings, but the same cannot be said for the Traverse city state hospital. Instead its thought the spirits who choose to linger here do so because they saw it as a place of happiness and not suffering. One interesting story to come out of this place is that within the grounds behind the main building is a tree which has come to be known as "The hippy tree" for some reason. A story has started somewhere that beneath this tree there is a portal to hell, though this sounds like an extra story someone just "threw in" and its gotten well known some how. As for the asylum building itself one of the most commonly witness phenomenon is lights turning themselves on and off in the upper rooms. This does not sound very spooky in itself but you have to keep in mind that the building has been without electricity for some time. Within the corridors moans and muffled voices can be heard echoing through the dimly lit walk ways, and apparitions of both adults and children have been witnessed roaming through-out the asylum. One of the most curious stories is that of a badly disfigured creature who is said to live within the tunnels and basements on the grounds. It is thought to have been the one responsible for slamming the basement doors as people approach the room. There is also an interesting story about how religious objects such as crucifix necklaces being destroyed before they can be brought inside.